Belarusian cities hold a week against fascism and antisemitism. Political prisoner Zmicier Paliyenka released from prison. A monument to the victims of Stalin-era executions was erected in Kurapaty by the pro-governmental Federation of Trade Unions. National campaign Budzma Belarusami! (Let’s Be Belarusians! in English) celebrates 10 years. The Golden Age University starts its 10th season. Journalists for Tolerance initiative developed a service for testing hate-speech. Kastryčnicki Economic Forum (KEF) gathered over 800 high-level guests to discuss global risks and future opportunities for Belarus in the new brave world. Ted X Minsk Women Showing Up conference is to take place on December 1 in Minsk. Week Against Fascism and Antisemitism will be held November 9-16, in Belarusian cities. The Week includes a series of educational activities aimed at promoting the ideas of respect and non-discrimination. The Week program includes films screening, social games, a human library, etc. The Week is initiated by the Human Constanta with the support of the human rights community. ‘Official’ monument erected in Kurapaty. A monument to the victims of Stalin-era executions was erected in Kurapaty on November 6, by order of the pro-governmental Federation of Trade Unions. The activists involved in the memorization of the repression victims received the monument with mixed feelings: some commended the government for the initiative; others insisted a memorial in Kurapaty should look differently. Political prisoner Zmicier Paliyenka released on October 24 after serving nearly two years in a penal colony in Babrujsk. The activist was prosecuted for his participation in a peaceful gathering. The human rights community named Paliyenka a political prisoner. After Paliyenka’s release, Belarus has one political prisoner held behind bars, Mikhail Zhamchuzhny. Week Against the Death Penalty. From October 5 to 10, the annual Week Against the Death Penalty was held in Belarus. This year’s events focused on the conditions of detention on death row. Belarus is the only country in Europe and the former Soviet Union, which pronounces death verdicts and executes people. This year two Belarusians were shot, and another four are awaiting execution. Students Week 2018 is to take place on November 12-18. This is an initiative of the Association of Belarusian students (ZBS) on the occasion of the International Students Day. The Week includes a series of educational and entertaining activities in different cities of Belarus – lectures, speed-dating, student Hackathon, urban quest and more. Budzma campaign celebrates 10 years. National campaign Budzma Belarusami! (Let’s Be Belarusians! in English) is one of the most famous and successful public campaigns in the country. For 10 years of its activity, the campaign has reached thousands of people in various areas, leading the Belarusian language to mainstream and approving that all Belarusian can be fashionable and actual. Golden Age University in Hrodna kicks off 10th season. The opening ceremony of the anniversary academic year took place on October 4, in Hrodna. This year, nearly 200 people aged 55+ became the students of the University. The Golden Age University is a non-formal education project, based on active ageing approach and implemented by the Hrodna-based Studio for Useful Competences. Launch Me Media Accelerator selected six best startups at the media Hackathon that took place on October 27-28. The winning ideas are related to Youtube contextual analytics, an article title’s generator, an interactive map of Belarusian dialects, etc. Launch Me is the first Belarusian accelerator for technology startups in the media industry. This is an initiative of Press Club Belarus and SPACE in partnership with the British Embassy in Minsk. Service for testing hate speech has been developed by Journalists for Tolerance initiative. J4T-Checker service allows entering the text, finding incorrect vocabulary regarding vulnerable groups and offering a replacement with an explanation. J4T-Checker works with such topics as LGBT, people with disabilities, people living with HIV, migrants, and more. Media Management & IT Forum was held in Minsk, on October 25-27. The forum brought together over 100 participants from Belarus, Eastern Partnership countries and the EU. The forum focuses on four key topics: media management & content creation, investigative journalism, media sustainability & new monetization resources, and IT tools & open source investigations. TED x Minsk Women Showing Up conference is to take place on December 1, at the Minsk Gallery Ў. The event will start with watching the TEDWomen2018 Showing Up global broadcast from Palm Springs (USA). Then four Belarusian bright women will present their creative ideas in economy, design, architecture, and medicine. 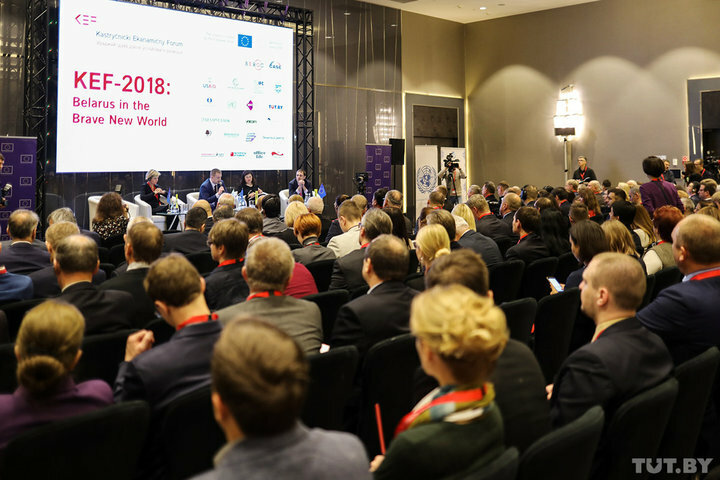 KEF 2018 gathered over 800 high-level guests to discuss global risks and future opportunities for Belarus in the new brave world. Kastryčnicki Economic Forum (KEF) was held on November 5-6, in Minsk, for the 6th time. The conference was opened by Alexander Turchin, First Deputy Prime Minister of Belarus, Katarína Mathernová, Deputy Director-General, European Commission, Satu Kähkönen, World Bank Country Director, and Alexander Chubrik, Director of the IPM Research Center. Media call the KEF among the main economic events of the country. Global Entrepreneurship Week Belarus will take place for the 8th time, on November 12-18. The main scene of BelExpo will host speakers from all over the world representing multinational companies who will share unique stories of business transformation, development of innovative products and company scale. The content of GEW Belarus is tailor-made for the business community and startup ecosystem. The scenario of energy [r]evolution for Belarus will be presented in Minsk, on October 23. The modelling work (resume) was done in collaboration with the Aerospace Center of Germany. The transition to renewable energy would allow Belarus to be among the advanced countries involved in the transformation of the world energy system. The presentation is organized by environmental CSOs. Survey: 40% of Minsk residents are not aware of any urban initiative. The rating of the most famous Minsk civic initiatives was conducted among Internet Minskers by the Baltic Internet Policy Initiative. The top best known urban initiatives are the protection of the Minsk historical district Osmolovka, a platform for group appeals Petitions.by and the Minsk Cycling Society; they are recognizable for one-third of those who are aware of the initiatives. Alexander Lukashenka meets Patriarch Kirill of Moscow amid the Orthodox schism between Moscow and Constantinople. Former Ukraine’s President Viktor Yushchenko visits Minsk. Prime-minister Rumas outlines the key priorities for the new government and calls for an urgent meeting amid the average salary’s decrease. Vladimir Putin wants to increase Belarus-Russia trade. Russian Ambassador Babich promises the end of “milk wars” in future. Belarus requires new re-industrialization worth billions of dollars. Lukashenka condemns military bullying, yet suggests students should undergo military training on summer holidays. Scandalous Strauss’s opera “Salome” features in Minsk’s Opera Theatre despite the religious protests. Lukashenka meets Patriarch Kirill of Moscow amid the Russian Church’s split from Constantinople, reports Soyuznoye Veche newspaper. On 15 October, Alexander Lukashenka welcomed Patriarch Kirill of Moscow and stressed the importance of the church unity. According to the President of Belarus, the recent Orthodox church’s split would negatively impact all the levels of the society in the Post-Soviet space. “It had a lot to do with politicians”, maintained Lukashenka. Patriarch Kirill, in his turn, praised the Belarusian neutral position and admired “big positive changes” in Belarus over the years. Prime-Minister Siarhei Rumas outlines the top priorities for the new government’s work, reports BELTA agency. According to Rumas, the increase of the nation’s well-being and the improvement of competitiveness of the state’s sector should remain the key government’s priorities for the next five years. Viktor Yushchenko visits Minsk, reports Belarus Segodnya newspaper. On 9 October, Alexander Lukashenka welcomed Viktor Yushchenko in Minsk to discuss Belarus-Ukraine relations. Lukashenka maintained that Belarus would always abstain from criticizing Ukraine’s political standing and interfering into Ukraine’s domestic affairs. On the other hand, the President of Belarus disapproved Ukraine’s intention to leave the CIS block and warned about the increase of arms smuggling via the Belarusian-Ukrainian border. Lukashenka intends to strengthen the state’s alcohol monopoly in order to combat the unfair competition on the alcohol market, reports Belarus Segodnya newspaper. On 22 October, Alexander Lukashenka held a special meeting to discuss the development of the national alcohol production. Previously Lukashenka strongly criticized the experimental ban on alcohol sales after midnight exercised by the Minsk authorities. At present, the Belarusian state fully controls the production and distribution of alcohol production. Prime Minister Siarhei Rumas calls for an urgent meeting amid the average salary’s decrease, reports Hrodna News. On 23 October, Rumas held a working meeting to discuss the average salary’s decrease recorded in September – for the first time since April 2018. According to Rumas, this situation happened due to the fluctuations of the Russian rouble and the ignorance of public administration. Belarus requires a new industrialization, reports “Finance, accounting and audit” magazine issued by the Ministry of Finance. In order to increase the Belarusian GDP from $54 bn in 2017 to $100 bn as planned by Alexander Lukashenka by 2025, Belarus has to re-industrialize its regions. The Belarusian re-industrialization should include the development of energy-saving and electric transport, “smart house” construction, petrochemical and microbiological projects, and production of new construction materials. Such large-scale projects will require at least $4 bn investments. Russian Ambassador Mikhail Babich wants to reload Belarus-Russia economic relations, reports Soyuznoye Veche newspaper. Mikhail Babich views his major task in supervising the duly implementation of the agreements between Alexander Lukashenka and Vladimir Putin on petroleum products. Babich maintained that the“milk wars” between Russia and Belarus sufficiently damaged the relations between the two states. At the same time, the “milk wars” might disappear in future due to the introduction of tight food balances. Vladimir Putin believes that trade volumes between Belarus and Russia could increase up to $50 bn, reports Belarus Segodnya newspaper. While visiting Mogilev on 12 October, Putin praised the large-scale economic cooperation between Belarus and Russia. Putin maintained that the trade volumes between the two states could increase from the actual $32 bn to $50 bn in the nearest years. Lukashenka condemns bullying in the military, reports Belarus Segodnya newspaper. On 5 October, Alexander Lukashenka criticized the Belarusian military for the bullying cases. According to the President of Belarus, bullying in the military strongly harms the image of the Belarusian troops and provokes young men to avoid the military service at all costs. Lukashenka urged the Ministry of Defense to eradicate bullying as soon as possible. Lukashenka’s criticism relates to the tragic death of private Alexander Korzhych and the ongoing trial of his military superiors. The final verdicts on Korzhych’s offenders should come at the beginning of November. Lukashenka discourages Belarusian students from studying abroad, reports Belarus Segodnya newspaper. On 20 October, Alexander Lukashenka visited Hrodna region and met the students of Hrodna’s Yanka Kupala State University. The President emphasized that Belarusians moving to study and live abroad would most probably remain “second-class citizens” there. The Hrodna region stands among the leaders in terms of students’ migration: many students from Hrodna easily move to neighbouring Poland for work and study. Apart from that, Lukashenka criticized the introduction of the Bachelor/Master diploma frame to the Belarusian universities. 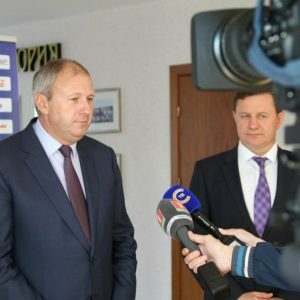 According to the President of Belarus, the Belarusian higher education system should aspire to become more practical-oriented rather than blindly adopt the Western standards. Lukashenka suggests drafting Belarusian students to the military on summer holidays, reports Hrodna News. During his visit to the Hrodna region, Alexander Lukashenka stressed that too many students misused their military service postponing in order to avoid the military service at all. The President suggested that first-course university students could undergo basic military training during the summer holidays. The second-course students could obtain a military specialization the following summer and continue advancing their military skills during the subsequent summers. 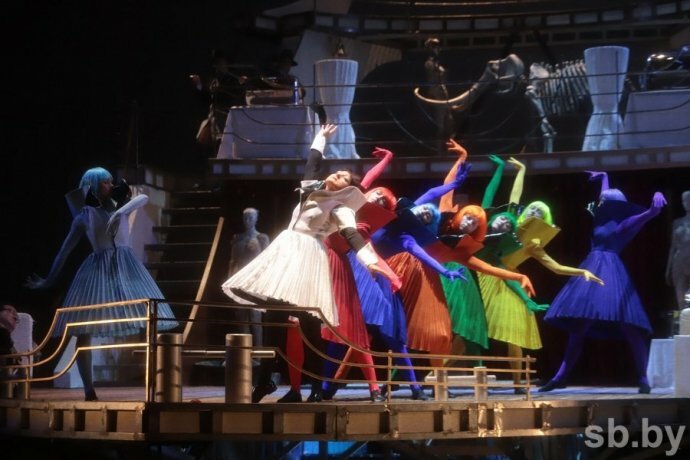 The Minsk’s Opera Theatre launches the premiere of the scandalous Strauss’s opera “Salome” despite the religious protests, reports Belarus Segodnya newspaper. Opera “Salome” describes the relations between John the Baptist and the members of Herod’s family, very roughly based on the Bible. The Belarusian protesters objected the launch of the opera’s premiere on 9-10 September, close to the commemoration of John the Baptist’s beheading on 11 September. Apart from that, the protesters described the opera as “promoting lewdness”. The Administration of the President of Belarus carried out the opera’s inspection together with the Prosecutor General’s Office and approved the opera. Metropolitan Pavel, the leader of the Belarusian Orthodox Church, also approved the opera’s staging. Eventually, the opera featured on 18 October.